Recently the tech giant Sony presented its latest device called NEX-VG10, which the company claims is the first interchangeable lens HD camcorder in the world. Besides being the world's first consumer camcorder that boasts interchangeable lenses, the device is the first of its kind to include an extra-large Exmor APS HD CMOS sensor (the same used in the Sony a NEX-5 and Sony NEX-3 digital cameras). 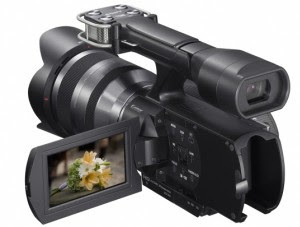 The Sony NEX-VG10 also supports high-grade "E-mount" series of lenses used for video shooting with silent operation. It is worth mentioning that these lenses are smaller and lighter. The new camcorder from Sony is also compatible with "A-mount" interchangeable lenses. Due to the fact that the Exmor APS HD CMOS sensor is mounted together with Sony's powerful BIONZ processor, the user obtains a tool able to shoot 14 megapixel still images and high-resolution video. It would be interesting to note that the Exmor APS HD CMOS sensor is 19.5 times bigger than other sensors currently used in conventional camcorders. Thus videographers can obtain cinematic results with striking background defocus. With Sony NEX-VG10 it is also possible to make DSLR-quality images using such features as Auto HDR, Handheld Twilight, and Anti Motion Blur. Besides, users can catch a fast action sequence at a nonstop burst rate of up to 7 frames per second. The Sony NEX-VG10 is able to make full 1920x1080 HD videos at up to 24Mbps for stunning clarity and detail, which is perfect for recording on to Blu-ray DiscTM media. The camcorder comes with an E-mount 18-200mm lens, which allows shooting video using an 11x optical zoom.